I most certainly did NOT spend every spare moment today cleaning my kitchen simply to mess it all up by going and spending $250 + at the grocery store and now it's all over what was my clean kitchen. I'm always thinking ahead so I most definately did NOT "punish" Emma for disobeying by taking away her evening at the Fireworks stand with Daddy...which if she had gone with Daddy would have made the grocery shopping trip a bit easier! It is NOT 11 p.m. as I type this with the mess and non-refrigerated foods still in the sea of white bags on my kitchen and dining room floor. And for those that know my pregnancy treats craving I do NOT have chocolate running down my face from eating a smore as I work on this blog!!! Being the mother cautious with my children's nutrition I did NOT skip making them grilled pork chops and baked potatoes to take them to the oh-so-unhealthy Yellow Arches in order to make it to the store in a more timely manner. Speaking of time I would NEVER be the mom that was just leaving the grocery store totally oblivious to the fact it was AFTER 9 pm. Seriously I did NOT spend from 7-9:30 in one store that didn't involve clothes, shoes or anything fun for myself?!?! And Aidan was NOT asleep within 2 blocks of the store. We didn't spend half that time in the bathroom because Emma decided to poo. While Emma took her sweet time Aidan certainly stood by me perfectly still like a gentleman. He NEVER tried to peek under the stalls at other women using the restroom and his hands NEVER touched any of the disgusting surfaces in said public bathroom. Oh yes, and Emma did NOT request (in front of a stranger) for me to look at her poo. Thank goodness for Autoflush! I missed getting to see it, but don't worry she took great detail to explain it to me! Back to Aidan...being the courteous shopper I am I would NEVER have allowed Aidan to scream off and on most of the shopping trip...retrieving things as quickly as he could throw them out. He did NOT open 2 different boxes of items before we reached the check out. I was using firm discipline the entire time and was NOT operating in survival mode! Hmm...weird. I think I've seen that kid before!!?? [Background] So after a long weekend that was exhausting (another blog to come later) I return home, put my feet up for a couple hours and then go to about 10 minutes of Matt's softball game- they kicked hiney so the game ended quickly. Grabbed a snowcone before heading home, bathing kids...yadayadaya bedtime routine. Kids in bed- time to run to Dillons to grab a few things to make it through tomorrow. My exhausted self enters Dillons looking great with full make up and a glow on my face . I waddle at a turtles pace, face had yet to be put on for the day, hair thrown up in a clip...the pillar of style and grace. I proceed through Dillons with little excitement. Grabbed the dozen or so items I needed. Cashier: "That baby coming any day?? Looks like it's going to be a 'healthy' one! When are you due?" Cashier: "Wow, you still have a while then"
Me: [thanks lady I'm feeling better with each moment I spend with you. YES. 6 1/2 weeks to be exact. holding back kicking her with my swollen foot] "Hahaha...yeah. Trend has been each child is a pound bigger than the previous." Cashier: "You saved $2.85 today. Take it easy honey"
She didn't?!?! OH YES LADIES SHE DID! A woman actually said to another woman, pregnant none the less- "Looking HEAVY" SERIOUSLY....HEAVY!!! On a day where the aches and pains of pregnancy were wearing on me to the max I encounter the most insulting conversation of all 3 of my pregnancies. I've had MEN speak in a more appropriate fashion. #2 Give her the benefit of the doubt. It was late and she spoke without thinking...I've been known to maybe do that. Maybe she's never had children. Doesn't understand what it's like to be a waddling, beached whale that is swollen and aches with each movement. Could be the case!!?? A 5 year old believes that sharing a chicken nugget with me will result in her getting my germs and therefore becoming pregnant. A 5 year old believes that running while pregnant is ok. The baby won't like it, but "IT" will have to "get over it". 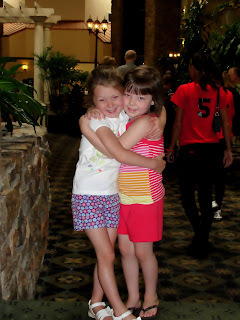 A 5 year old believes that us having baby #3 means we're becoming the Duggars. A 5 year old believes that she is not responsible to help care for the baby because it "wasn't her choice to have another baby, it was mommy's and daddy's". A 5 year old believes that mommy shouldn't cry during labor. "Just be tough." She also thinks she wants to be present at the birth and will "be tough" and not get scared or grossed out. A 5 year old can maintain the same name idea (for only a girl) for the entire pregnancy. Madeline or Juno are the names she's hoping for. A 5 year old is aware that daddy has "swerms" and mommy has an egg, but luckily has yet to make connections or ask questions on how those "meet" to create baby brother or sister. This same 5 year old informed me I should not feed the baby from a bottle, yet should give the baby milk from my "boobies". Except when she wants to feed the baby...wait I thought she signing away her "helping rights" since this child was not her decision!!?? Thanks little Miss Lelecha League. Sorry to disappoint all the nursers out there. It didn't work for this dry well the first 2 times, and my desire to attempt it this time is nill. That's about all the funnies so far. Still have 7 weeks to go, and have a feeling that closer to delivery it could get more and more interesting to hear her ideas and comments! A fresh, new baby wrapped like a burrito! So, there it is 31 things I love. Some of them obviously reflect my current preggers state!! :) My job for the next year...come up with one more thing to love. That should be easy! 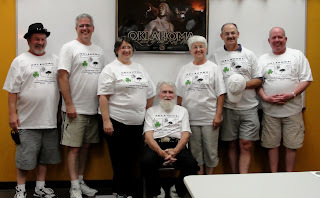 Last weekend we traveled to Oklahoma City to attend the Brennan Family Reunion. The Brennans have been hosting a reunion every other year since 1989. A lot has changed since that first reunion held at Stumble Stone Acres in Cape Fair MO. We've lost several cherished loved ones through the years, yet each time we get together it's a great time. Here's a photo of everyone in attendance this year. It was actually a small crowd compared to some years in the past. 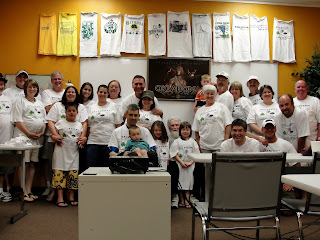 Most attendees were my mom's siblings and their children/grandchildren. Of course THE "Brennan" himself Grandpa John was there. It just simply wouldn't have been the same without him!!! So glad God has given him the health to travel!! Thanks again to Joe & Rodney and Gary & Patty for your hospitality!! 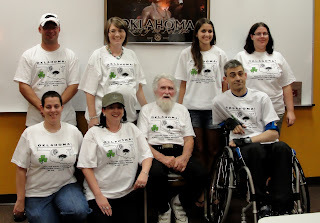 Below is my mom and 5 of her seven siblings with Grandpa. Not pictured Lisa & Vic. Here are the Grandchildren of Grandpa Johns. Mike, myself, Brooke, Amber, Melissa, Jenny, and my crazy brother. Not pictured: Marcia, Brian, Megan, Beth, Diane, Nathan & Amanda. 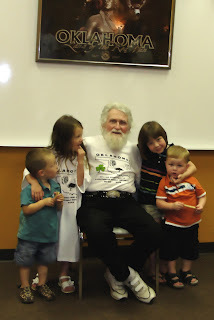 Below are a few of the Great-Grandchildren. Pictured are Dallen, Madison, Emma & Aidan. Not pictured: Sabastian, Jarod & of course the coming Stout Sprout!! Here's a shot from the 5th Reunion (2nd held at Stumble Stone) in 1997. Look at all those people!! 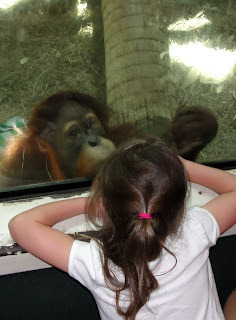 Saturday morning of our reunion weekend we went to the OKC zoo. 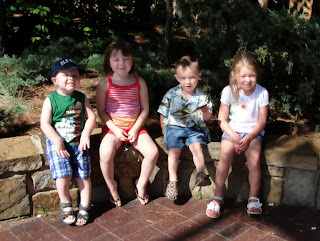 Here's a pic of the 4 kids before hitting the zoo hard! 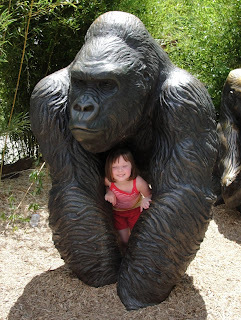 Emma with her gorilla friend. 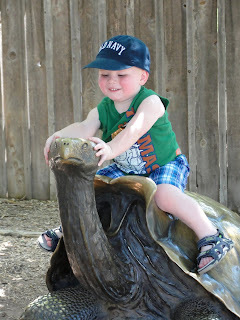 Aidan and his friend tortoise. 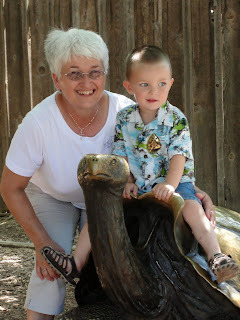 Mimi and her buddy Dallen riding the tortoise. 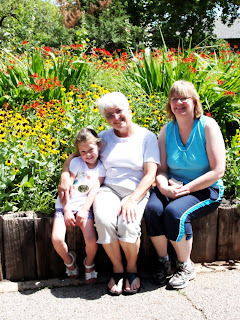 Beautiful pic of Madison, Mimi & Stacy. 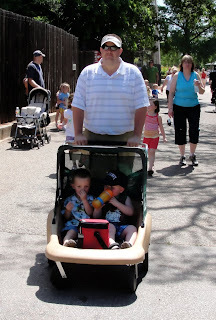 The muscles behind our zoo adventure. Matt was a trooper pushing a cart full of little boys or little girls through the heat! Yes! I was actually there! 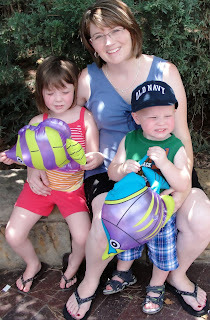 Here's a shot of an exhausted mommy and her 2 kids after our Zooventure!! The boys didn't make it long out of the zoo before crashing!! It was nap time! Our hotel had an indoor pool so the kids enjoyed swimming Fri. night, Sat. afternoon and even Sun. morning between breakfast and check out! 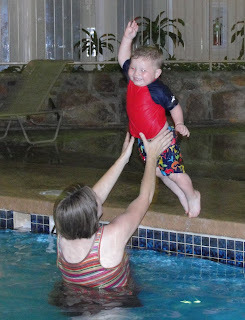 Dallen preferred the hot tub, the girls enjoyed splashing on the stairs, but Aidan took COUNTLESS jumps into the water! He is fearless about jumping in!! He would count before jumping...1,2,1!!!! As soon as he hit the water he would say "More, MORE!". 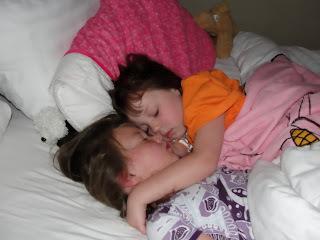 Sweet shot of Madison and Emma snuggled up catching their Zzz's for the Zoo! 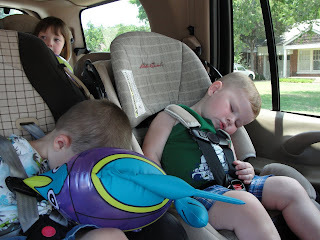 I think the swimming made them tired! After a good nights rest and some breakfast they are ready to hit the Zoo! Another exciting event of the weekend (which I forgot to take a picture of!!!) was going to dinner with Jason and Meg!! It was great to see them and was a chance for Jason and Matt to meet!! We look forward to seeing them again soon! Wellp the OKC trip will probably be one of my last trips too far from Wichita until post new Stout Sprout. I do have 2 short trips planned to go back home...but don't think this preggo body will cross Kansas state lines until after August!! Had another OB appointment today. I'll be 32 weeks Thurs. All was well as usual. I talked with the Dr. about my dizzy/passing out spells. Having them every 4 days or so. I assumed it had something to do with my low hemoglobin and lack of remembering to take my extra iron. Her guess was more low blood pressure or low blood sugar or a combo. My BP was 92/60 and considered it on the lower end of "normal" I guess. The incident today that lead to me feeling faint followed eating a donut which might imply blood sugar. Other than that it's normal prego feelings. I was released from PT about 1 1/2 - 2 weeks ago. Unfortunately with in a few days my back was in real pain. I'm thinking all the PT we do can't keep up with the load and position of the baby. Swimming has helped and kept the swelling down. Really needed to go this week, but just haven't had the time. The baby's heart rate was 147 today. A bit higher than Aidan's...if that means anything. Most everyone I see (even strangers) says "you're having a girl aren't you? ", except this week I had one lady say "you're carrying a boy!!" Um...I dunno lady...we'll all have to wait and see. I'm sure it will be a boy as we are STILL fretting over girl names. I think we're getting close, but one (Matt's fav) that we've ran by a few folks gets mixed reviews. Maybe this should be a surprise all the way around!! I'm super excited as I'm working on getting maternity photos scheduled. Not sure I have the outgoing personality for major naked/revealing prego pics, but at least some tasteful ones with the other 2 kiddos. I've been horrible about taking belly pics this time...so maybe some "professional" pics will make up for that. Will also mark the memory of what I plan to be my last pregnancy!! It'll be 3-4 more weeks until I have them done. A while back I searched online for different ideas on hair bow holders for all those precious little hair bows lil' girls seem to accumulate. I found several cute ideas and of course made notes of ones I liked best. I also noted the immense amount of money some of these "crafters" wanted to charge for such an item!! Most "custom" hair bow holders like what I have made were close to or more than...get this...$60. YES! SIXTY!!! Convinced to save $ off to Hobby Lobby and Walmart we went. I purchased three rolls of coordinating ribbon (pink, green, pink/green stripe) and some wider (white) grosgrain ribbon by the yard. We also bought 2 bottles acrylic paint in colors to match our ribbon- in our case green and pink, along with a larger bottle white paint. We happened to find the "base" board with metal scroll top at Walmart- identical to the example I found online. I started by deciding I wasn't going to hand paint Emma's name on the base. So I went to my supply of cardstock scraps and my trusty, best scrapbooking invention EVER- my Cricut! I cut Emma's name using scraps of green and pink papers. Letter faces in pink with green shadows. After painting the base white Emma assisted me in painting the pink and green polkadots. We then took the letters cut earlier and used ModPodge to adhere them to the base. I then coated the entire base in 2 layers of ModgePog. Next, I hot glued the lace and trim along the bottom edge. I questioned whether or not to add them, but Emma insisted. I then cut to length 3 pieces of the wider width white ribbon and 3 pieces of narrower colored ribbon. (Our colored ribbon was pink and a pink/green stripe) I layered the narrow ribbon on top of the wide ribbon then attached them both using my stable gun. I attached one set of layered ribbons to the center of the base and the other 2 on either side. I also used one of the coordinating ribbons (green) to make a hanger by tying the ribbon to the metal scroll work. I used that same ribbon to "finish" the tails of the ribbon lengths by hot gluing a strip of it around the bottom of the layered ribbon ends. Much to my shock making what I thought was a decent sized hair bow holder turns out to be completely full of bows. Ugh now what!? To purchase the one I found online was about $60. I would estimate making this on your own to be: $5. for base, $10. in ribbon/trim, $3. in paint, $2. for paper, and $3 for Modpodge. So, for about $23 you could make one for yourself in minimum time- plus have extra paint, ribbon, paper and Modpodge to make more to give as gifts! !